Dr. George Nicholas Atiyeh passed away Monday, April 21, 2008, peacefully and surrounded by his loving family after a long illness. The eldest of 10 brothers and sisters, Dr. Atiyeh was born in 1923 in the small town of Amioun in northern Lebanon. He was driven by a perpetual sense of curiosity about history, culture and literature. Dr. Atiyeh read avidly—first his father’s rich collection of books about the Middle East, then books he bought with his own monthly allowance. 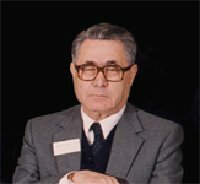 Dr. Atiyeh graduated from the American University of Beirut (B.A., 1948, M.A., 1950), and received his doctorate in oriental languages and literature from the University of Chicago in 1954. He was professor and chairman, Department of Humanities, of the University of Puerto Rico from 1954-1967 before joining the Library of Congress (LC) in 1967 as Head of its Near East Section. In 1991, he became Acting Chief of the African & Middle East Division of the Library of Congress, supervising its Near East, Africa, and Hebraic Sections. He served at LC until forced to retire for medical reasons in July 1996. The Near East Section of the Library of Congress is responsible for materials in the languages of the Arab world, Turkey, Iran, Afghanistan, Central Asia, and the Caucasus. Under Dr. Atiyeh's direction, the holdings of the Near East Section have become world-renowned. While directing and informing the work of specialists concentrating on Turkey, Iran, and other areas, Dr. Atiyeh applied his knowledge and scholarship to development of the Library's collections of Arabica. Among other accomplishments, he acquired numerous rare publications from the Arab countries; identified and acquired Arab-American newspapers published in the early 1900s; brought leading Arab authors to the Library to record their own works for the Archive of World Literature. He developed acquisitions guidelines for the Library of Congress Office in Cairo that became a prototype for use in the Library's other field offices. Over the years, he paid numerous visits to the Middle East, developing contacts for the Library of Congress, acquiring publications, evaluating book sellers and other potential sources of scholarly materials, and, not incidentally, in his many official visits with publishers, book sellers, research centers, archives, and universities, conveying the message of American scholarly interest in and expertise on the Middle East. Dr. Atiyeh undertook or participated in a series of major programs at the Library of Congress designed to illustrate the scope of its collections and to heighten scholarly interest in the Middle East. With the Center for the Book at the Library of Congress, he organized a major conference on the history of printing in the Islamic world. Held at the library, this conference included speakers from several countries. Dr. Atiyeh edited the papers presented at the conference and published them as The Book in the Islamic world, co-published in 1995 by the Library of Congress and the State University of New York Press. The conference, the associated special exhibition of treasures of Middle Eastern publication from the Library's collections, the published conference papers, and the bringing together of experts from around the world to meet and discuss the book in the Islamic world were all monumental contributions to the field of Middle East studies. During his long and fruitful career, Dr. Atiyeh developed relationships that benefited the Library of Congress and other government and scholarly institutions, and the field of Middle East studies as a whole. He served on the U.S.-Egypt Joint Commission on Culture of the Department of State from 1975-1978 and in 1979 was invited to serve as a member of the advisory committee on Islamic affairs at the White House. He served as a member of the advisory council of the Center for Contemporary Arab Studies of Georgetown University; the advisory editorial board of the Middle East Journal; the Arab-American Affairs council; and the international advisory board of al-Furqan Islamic Heritage Foundation, London. During his last official trip abroad, Dr. Atiyeh accompanied the Librarian of Congress to the opening of the Mubarak Library in Cairo and on visits to key Egyptian officials and institutions. As a member of the Middle East Librarians Association (MELA) since 1971, he guided and advised the association and its members, influencing the librarians who head and work in the numerous Middle East collections around the country that serve the needs of the members of MESA. In 1997, his MELA colleagues named him the first (and only) honorary member of that organization. Dr. Atiyeh was the author of, in his own all too modest description, “several books and bibliographies.” He has also written numerous articles on various topics, including Arab philosophy, al-Kindi, Christian-Muslim relations, intellectual history, and librarianship. Dr Atiyeh is survived by his loving and devoted wife, Daisy, and three children, George, Rose Marie, and Lancelot. The funeral service will be conducted at Sts. Peter and Paul Antiochian Orthodox Christian Church, 10620 River Road, Potomac, MD, Monday April 28, 2008 at 7 pm followed by the burial service on Tuesday, April 29, 2008.